Jorson and Carlson Co. stocks paper drills for all major paper drilling machines and drill blocks and sticks. Included in stock are many sizes, models and material qualities of paper drills. Some of the paper drilling machines we stock drills for are the following: Baum, Bielomatic, Challenge, Corta, Hang, HFD, Imperial, Iram, Lawson, Lihit, Martin Yale, Nygren Dahly, Pioneer, Seybold, Spinnit, Sterling. Manufactures of paper drilling machines will sometimes use one of the drill styles from above for their new machines. If you do not see your drilling machine name listed by Paper Drill Manufacturers, ask us to help you identify what you might need. And, for that extra large drill diameter, we supply JUMBO Paper Drills. When ordering new paper drills you must identify the name of the paper drilling machine, the diameter of the hole to be drilled, the quality of the drill, such as regular steel, Teflon Coated, Titanium Coated or Fluted inside diameter. The last thing is the Overall Length & Lift Capacity. This last factor comes into play when certain machine builders manufacture different models for drilling different lift size capacities. They use the same style drills except make them longer. On most drilling machines you can control the RPM of the drill spindle and the down feed rate. Check with the machine builder’s operation manual for the speeds they advise to be used for what drill diameter and the material to be drilled. Wrong speeds and feed rates will cause premature dulling, flaring and changing the tempering (hardness) of your drills. To keep paper drills at optimum drilling they must be kept sharp and clog free. 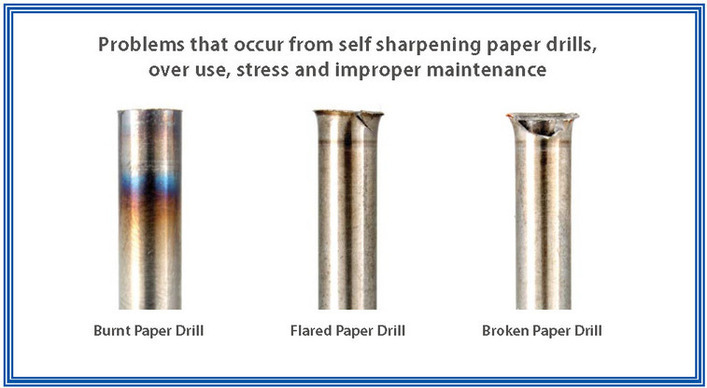 Dull and clogged paper drills are the main cause of drill breakage and flared cutting edges, especially on smaller diameters. If you notice discoloration in your paper drills, you are not maintaining them properly. When sharpening paper drills, you must first clean the inside shaft to remove the paper chads. Then sharpen with a sharp reamer to the correct bevel and lubricate the entire drill inside and out. Remember, using a dull or incorrect angled reamer contributes to flaring, drill breakage and the drilling of over-sized holes. Jorson and Carlson can provide you with the service to maintain new paper drill geometry. We will cut off flared drills if needed, clean out the chads, sharpen and lubricate them. All you have to do is ship them to us and we will do it all. Sharpening your own paper drills and having difficulty unclogging the paper chads, check out our paper drill CLEAN OUT TOOL a Jorson & Carlson exclusive product. Cleaning paper chads has never been so easy. Also, ask about our our paper drill sharpening reamers and hand sharpeners.